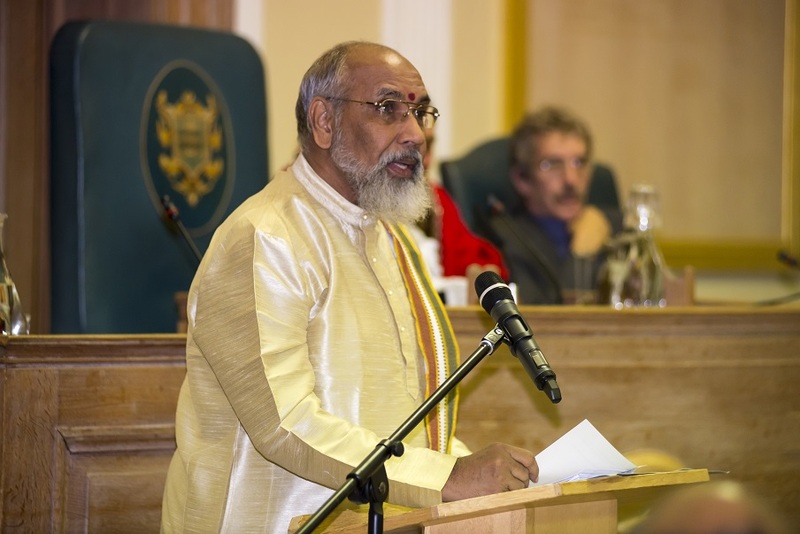 Tamil Guardian interviewed the Chief Minister of the Northern Provincial Council C V Wigneswaran in London last week. The twinning of the Royal Borough of Kingston in the United Kingdom with Jaffna in the Northern Province has opened up new avenues for the regeneration of the war torn North-East, as the region struggles to prosper following decades of armed conflict. “This is the first time that we are entering into an agreement of this nature,” said the Chief Minister of the Northern Provincial Council C V Wigneswaran, in an interview with the Tamil Guardian in London last week. Outlining five key areas of the project – education, health, economic development, cultural affairs and governance support – the former supreme court judge said the initiative had the potential to spur development in a wide range of different sectors. With talks underway for a new constitution for the island and accountability for human rights abuses due to be discussed at the UN Human Rights Council once more, the twinning project comes amidst years of struggle for a return to normalcy and uplifting the livelihoods of the Tamil people, since the armed conflict ended in May 2009. However, in order to reap the full benefits of the project, a range of obstacles need to be overcome and Sri Lanka`s government must allow an opening up of the North-East, said the chief minister. During his visit to inaugurate the twinning, he met with doctors at Kingston Hospital, British government officials and entrepreneurs from the UK. The potential benefits were vast, from assisting the Northern Provincial Council to govern with more transparency and accountability, to “working with the Foreign and Commonwealth Office in creating a vehicle for safe investment into the Jaffna district for expatriate Tamil communities in Kingston”. Even development of the co-operative sector in Jaffna has been earmarked by the chief minister. “This is something that has been neglected for a long period of time and it has got so much intervention or intrusion by the governmental sectors,” he said. Interfence by the Sri Lankan government has been blamed for holding back growth in the North-East, which continues to be plagued by a high level of poverty, increasing illicit drug use and has a continued massive Sri Lankan military presence. “An inclusive society cannot be built with a counter-terrorism mind set,” Justice Wignewswaran told an audience in Kingston last week. And despite initial opposition to the twinning project, he hopes that such initiatives will help to convince the Sri Lankan state to intice investors to fund startups and build a new series of links across the region.In particular, he pointed again to the role the Tamil diaspora can play in helping to rejuvenate growth. Justice Wigneswaran speaking with members of the diaspora in the USA earlier this year. And it is that global Tamil diaspora that Justice Wigneswaran believes can play a crucial role in the future of the North-East, including those of the second and third generation. However, he acknowledged the difficulties that lay ahead in forging closer ties with the diaspora. Many groups remain banned as `terrorist organisations` by the Sri Lankan government. Even under Sri Lanka`s current regime, Tamils returning to the island have been detained and deported by Sri Lankan authorities. “The government of Sri Lanka must not look upon the diaspora as those who are only interested in separating the country, dividing the country and so on,” said the chief minister. Indeed, the inclusion of the diaspora can not only help the Tamil North-East, but could also provide some much needed assistance to Sri Lanka`s faltering economy. “The government of Sri Lanka must give us the chance to enrich the country as a whole while we are looking after our interests also,” he continued. The chief minister went on to echo this appeal to Sri Lankan leaders several times. “There may be a certain amount of suspicion amongst the Sinhala community,” he acknowledged, but added that it must be overcome to further stability across the island. Yet, Sri Lankan leaders have failed to deliver that message to the masses in the south continued an exasperated chief minister. Vehement opposition to Indian investment in the North-East was an example of that failure to communicate, he added. “The Sinhala community I'm sure will understand if we are on our part really open and transparent on our relationship.” Sri Lankan political leaders however have not been actively relaying that across to the Sinhala people. Despite calls for an approach that demonstrates a genuine commitment to solving the island's ethnic conflict, Sri Lankan leaders “have not changed and they don't seem to be wanting to change for political reasons,” he added. Tamil leaders on their part must continue to reach out to the south and articulate Tamil aspirations too, he added. One example was the Ezhuga Tamil rally held last month, which drew thousands of peoples to the streets of Jaffna. 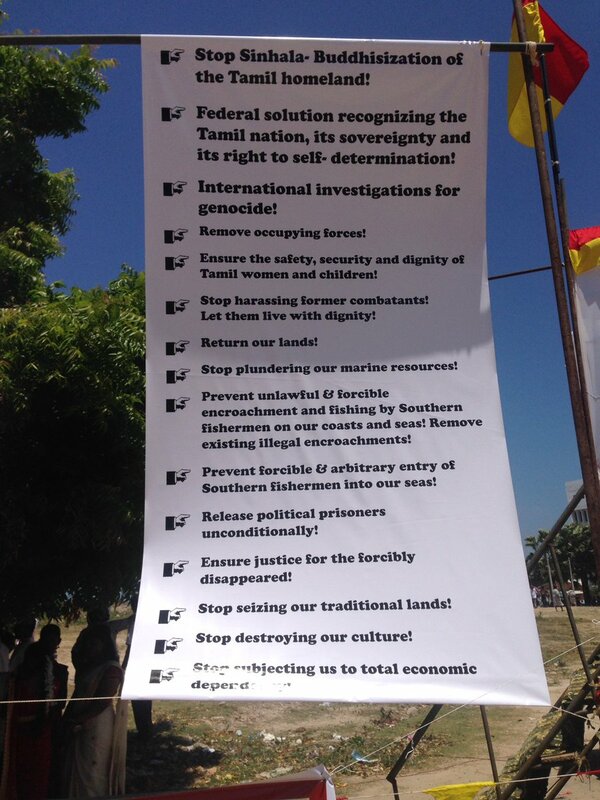 Notably, banners at the demonstration had demands written in English, Tamil and Sinhala. Despite these attempts the Sinhala community seems to have misconstrued the march, opined the chief minister. “But unfortunately the main mass of people have been fed with the wrong idea about the Tamil masses and with regards to the idea of federalism and as a result they have a completely distorted view of what we are asking, what we are saying, what we want, what our aspirations are,” he continued. As talks regarding a new constitution for the island are underway, the understanding of calls for federalism and self determination need to be better explained to the south, said Justice Wigneswaran. Stating that he had already submitted a list of recommendations to the Sri Lankan government, he spoke of how calls for a devolution of power should not be shied away from. For the chief minister, the recognition of these core Tamil aspirations is key to bringing about stability on the island. “The fact that the North-East has been always, for almost 2000 years or more, have been Tamil speaking areas must be recognised by the government,” he said. The significant Muslim population in those areas too must have their voice heard he added. “With regards to the administrative benefits that Muslims want out of a merged North-East, that's a matter for discussion between the Tamils and the Muslims,” he added, but said he was aware that “the Muslims probably would like to have more powers as far as the areas where they are resident is concerned”. “So that should be granted to them,” he declared. Muslim protestors urged Justice Wigneswaran to take action and resettle them in Jaffna earlier this year. Efforts such as state sponsored colonisation of those areas though has only reinforced scepticism of the Sri Lankan government's commitment to building a future that will meaningfully empower stakeholders in the North-East. The building of these Buddhist places of worship across the Tamil-speaking regions has been extensive and accelerated since the end of the war. Despite repeated calls for a halt in construction, and even cases where court orders have been issued, new Buddhist sites continue to spring up undeterred. C V Wigneswaran told the UN Secretary General, Ban Ki Moon who visited Jaffna in September,that the Tamil people would not be satisfied regarding unless international judges and prosecutors were included in a war crimes enquiry..
Colombo's sincerity in solving the issues that continue to heighten ethnic tensions on the island have been questioned in other areas too. Though Sri Lankan co-sponsored a resolution at the UN Human Rights Council agreeing to include international judges and lawyers in an accountability mechanism, various leaders have repeatedly backtracked from that position. The Sri Lankan president has stated several times in public that he will not allow any foreign participation in an accountability mechanism. It is with persistent engagement from the international community that the chief minister believes Colombo can be coaxed into progressing on those key issues – a point that he has raised to international delegations that have visited Jaffna.